The Full-time MBA program has one of the most reasonable tuition and fee structures of any top MBA program. Approximately 70 percent of Haas students receive some form of financial assistance, including scholarships and loans. Your primary point of reference and official source for any Haas financial aid questions or information should be the Haas Financial Aid Office. Be sure to select the appropriate tab on this page for the program you are interested in (Full-time MBA, EWMBA, MBA for Execs, MFE). This will be the primary source of financial aid for most veterans. Please see our Post 9/11 GI Bill Process page for information on how to determine eligibility, apply for benefits through the VA, and receive benefits through the Cal Veteran Services Center. The only payments that you'll actually receive from the VA are the housing (BAH of an E5 w/ dependents) and book stipends. All other payments will be sent directly to UC Berkeley from the VA. The precise amount of tuition and fees can fluctuate but if you're 100% eligible, you won't pay anything out of pocket. 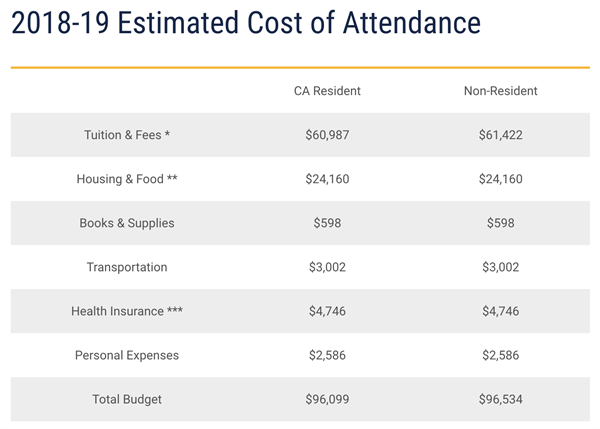 Also, there's no need to establish California residency to receive in-state tuition since there is a nonresident supplemental tuition (NRST) exemption for the Veterans Access, Choice and Accountability Act (VACAA). You should note that the housing stipend is prorated by the day. For example, for the months of August, December, January, and May you won't receive the full payment--it will only be partial. Additionally, you won't receive the housing stipend during the summer since you won't be enrolled in classes. You can offset this with a paid internship, however.